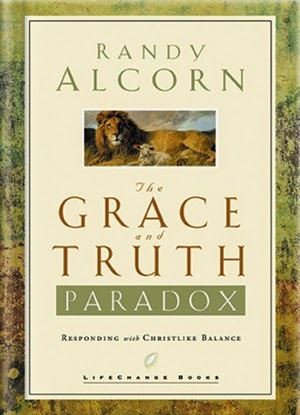 Randy Alcorn has a fantastic book called The Grace and Truth Paradox. I highly recommend it to you. It is concise and packed full of wisdom. What does grace mean? What is truth? What does it mean to be full of both grace and truth? What would life look like if we were all grace and no truth? What would life look like if we were all truth and no grace? Jesus was full of both truth and grace. What does that kind of life look like? How do we pair the two to live the balanced and full Christian life? Alcorn addresses all of these questions. Grace is amazing, truth is essential, and paring the two is vital for full life in Christ. Take some time today to study John chapter one. Order a copy of The Grace and Truth Paradox. Seek to live a life like Jesus Christ -- full of grace and truth.